​The Sacrament of Penance and Reconciliation (commonly called Confession, Reconciliation or Penance) is one of seven sacraments of the Catholic Church, in which the faithful obtain divine mercy for the sins committed against God and neighbour and are reconciled with the community of the Church (Cf. Vatican II, Lumen Gentium 11 §2; CCC 1422). By this sacrament Christians are freed from sins committed after Baptism. 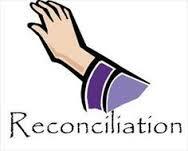 Reconciliation is held in the Church on a Saturday morning from 11-12.00 noon or at any other time that the Parish Priest is available.